I live in Maine and Vermont is two states away. They have similar issues with cold springs and short seasons, so their seeds do well for me. Their seeds are expensive but good. Good varieties, good germination, good selection. They also have a nice selection of open-pollinated seeds so if you seed save, the little bit more you spent on these seeds amortizes immediately. High Mowing is one of my favorite seed suppliers. The only reason I don't give it ten out of ten acorns is that the seeds are often more expensive than its competitors. That said, they do a lot of internal development, which is the reason why their varieties and their germinations are so good. It's a tradeoff. Jane Southall wrote: Shelah, I looked up natural enemies of your borer. You might not want woodpecker. Have you tried attracting nuthatches? Just a thought. Good luck to you. You have my sympathies. Nuthatches! Who knew! We are in the middle of a forest of white pine and balsam fir, American beech, red oaks — lots of nut trees — and we have already planted walnuts and chestnuts. I have not seen any nuthatches but didn't know (until just now) how to identify them, so we may have them. We have put out bird houses (for barn swallows, to eat the mosquitoes and black flies) — that have attracted only chickadees but that's the right size bird. We haven't put out bird feeders. So brilliant, we'll try black oil seed and see what that accomplishes. Either way, many of our wild trees in the forest are being attacked by various plagues and having birds around to keep the insect pests down could only be a good thing. Thanks for the tip! I have the same problem — sick old apple trees on a property bought a few years ago. Their problem is round-headed apple borers. I've gone in numerous times with piano wire and knife to get the worms and always I think I've got it then a few weeks later, more frass. We planted about 25 young apple trees and they've infected about four of them so far. So I've gone in and attacked the borers on the young trees I think they might be OK so far but these old trees are serving as borer nurseries. I've painted all the trunks with different things — latex/joint compound, clay, Surround — and I find it does not protect the tree, it only makes the frass show up better. At first I was gingerly with the knife, just used the piano wire, but the damage is getting so extensive that this year I went and cut out everything the least bit soft and rotted, went in up and down to try to root out where the borers were hiding with the wire, and in the mother host tree, they're still there. I don't know what to do. I pruned the trees pretty severely the first spring and that did them a world of good, but the borers threaten the whole orchard. They make this bread at the best bakery in the Boston area, Anna Rosa's Bakery (Salisbury, MA, http://www.annarosas.com), in a long Pullman pan, probably closed on the top, so it has the height of a normal piece of sandwich bread. It is VERY dense, and it has a long shelf life. It is similar to some of the breads they eat in Scandinavia, and my Norwegian husband says it should be sliced thinly, around 3/8" or less. I bought one of these breads for him when we were dating; it weighed a lot and slicing it was like a day's work. As to a recipe, I think it may be close to the Westphalian Pumpernickel you'll see in Stanley Ginsberg's _The Rye Baker_. If you read extensively in Oehler, he mentions that he has a lot of troubles with gophers. You may or may not, depending where you are. But critters live in the ground, and this must be taken into consideration. Maybe a lining of hardware cloth or some other kind of wire mesh between the soil and the plastic would be helpful. Also, plastic breaks down over time. Not so that it goes away but so that its structural integrity is compromised and it breaks into microparticles. So you might design so that in ten, fifteen years, it would be accessible to go in and replace the plastic. We're in Maine and when we bought our land, all the trees in the orchard had severe deer browse damage. We put up 8' fencing around the entire growing area (about half an acre); my husband did the labor along with a local guy who he paid $15/hour and together it cost us ~$4-5K, which wasn't cheap. It could have been cheaper only we used hexmesh wire fencing coated with black vinyl — the effect is that you can hardly see the fence — and he created two fenced-in areas, not one, with a path between them, so we could bring down a wheelbarrow through to another growing area we have beyond. The first winter the fence was up, we got a huge dent in a couple of the fences, as though a doe tried really hard to body-slam her way in sideways and failed. So breaking this grazing habit took a fence that was both sturdy and tall. This winter we got about 5' of snow and that's the real danger with fencing, that it seems like it's really tall but in the winter when the deer are hungry and you're walking on ice a few feet above the soil, the fence isn't that high at all. However, what mattered is that the fence broke the deer's habit of browsing in our orchard. We have had no problems with deer jumping what is now a low fence. Elsewhere where we planted unprotected apple trees, most of them have been grazed, so the deer are still in the area. Because we've cut down a copse of pines to make another orchard near those unprotected apple trees, we know we're going to have to fence in that area too. I'm not looking forward to the expense; however, my husband left a ring of pines at the perimeter, and the fence will attach to the pines. This means that the bulk of the work — which is digging the holes and pouring the concrete for the poles — can be skipped. So this fence will be cheaper. If you can leave trees on which to attach your fence, do so. Yes, it's edible, but there is an important use for this. It is highly effective against lyme disease. [Japanese Knotweed] is a broad-spectrum antibacterial and has been found effective against spirochetes including Borrelia burdorferi(Lyme). It is an antiviral, immunomodulator, immunostimulant, laxative, diuretic, expectorant, antitussive and a capillary stimulant. The capillary stimulant action is of specific importance in Lyme treatment as it increases the blood flow to areas where the Lyme spirochete likes to live such as the eyes, skin, heart and joints. This then helps to carry the medicinal constituents of any treatments to those places. This makes it a great addition to any Lyme treatment formula/protocol. 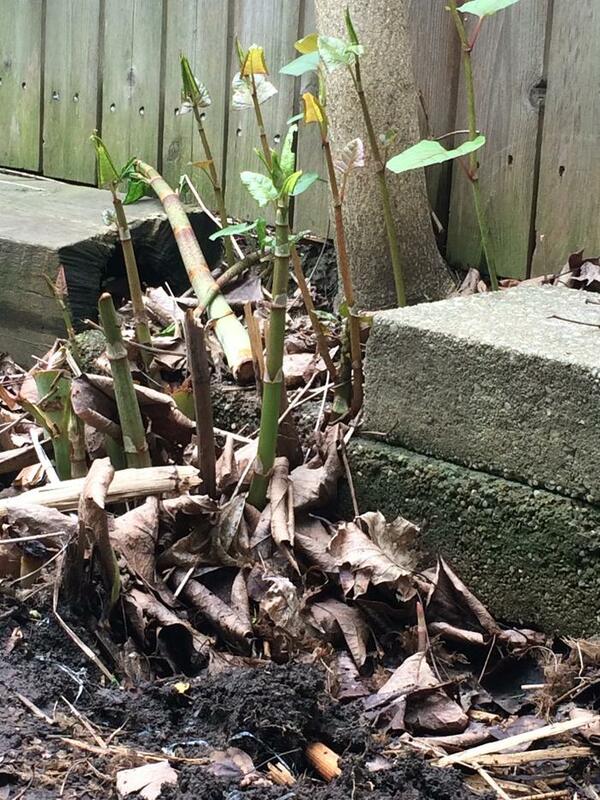 When my dog got lyme, I gave her Japanese knotweed (dried in capsules); she rapidly improved. I then brought her to a vet who put her on antibiotics. I stopped the knotweed. On the antibiotics alone she relapsed sharply, but eventually got better. Given that the subject was a dog, I think we can rule out placebo effect. If she were to get lyme again, I would give her the knotweed in a flash. If I were to get lyme, I would take the knotweed, and only resort to antibiotics if the knotweed didn't work.